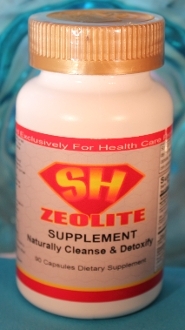 Ingredients: Zeolite (a natural mineral), Vitamin B-12, Calcium; Other Ingredients: Gelatin, Magnesium Stearate, Silicon Dioxide This mineral, which is approved by the FDA as safe, has remarkable physical properties. It is one of only two minerals that is negatively charged by nature, which means it actually attracts the toxins from the body like a magnet. Remove heavy metals such as lead and mercury that interfere with nervous function and gastro-intestinal function. Capsules for recommended for anyone in good health. Take two capsules three times a day for 30 days (dosage in two bottles). Drink plenty of fluids. When detox in complete, continue to take two capsules one time per day or 1 capsule two twice per day.